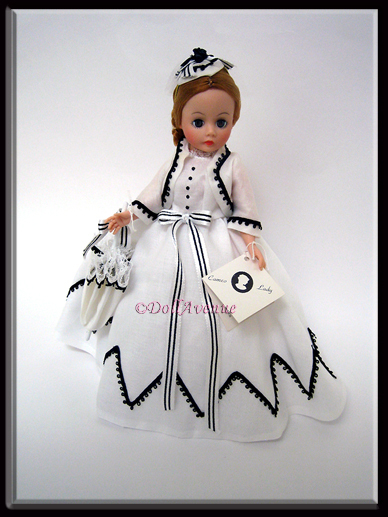 10" Cissette Portrait Doll "Cameo Lady" made by Madame Alexander in 1991 exclusively for Collectors United. and a Limited Edition of 1,000. This lovely lady has beautiful reddish blonde hair pulled back in a curly ponytail and pretty blue eyes (with blue eye shadow). She is exquisitely costumed in a white Victorian style dress of imported white cotton organdy with Victorian black trim, matching jacket with peplum. On her head, she wears a dainty bonnet trimmed with tulle and a black rose, and carries a matching ruffled parasol trimmed with lace. Her handtag has a tiny black cameo on the inside cover, along with a description of the doll's costume. Click on the link below to see a photo of the hangtag. This beautiful, pre-owned LE "Cameo Lady" will arrive in excellent, undisplayed condition, in her original box with her hangtag and registration card.